Retreating from the pace of our lives can open us to new possibilities. We’re inviting you to a journey of direct experiencing, sensing and being, witnessing the mystery of existence unfold. Join us for a time of deep self-connection at Ixopo Buddhist Retreat Centre in KwaZulu-Natal. The main focus of the retreat will be on direct experiencing primarily through dyad work but also through individual and group processes, including body-work and integration time in nature. Nicholas Burnand (CNVC Certified Trainer, Blabla Belgium) and Sarah Dekker (Director of Language that Works South Africa) will co-facilitate the retreat. This is not a self-improvement workshop, in which certain aspects of ourselves would be perceived as needing change, fixing, healing. The participants will be continuously encouraged to experience and embrace the Whole, rather than move from an „imperfect” state to a „better” one. Dyads are a powerful meditation technique in pairs. In contrast to silent meditation methods practiced alone, this one is practiced face-to-face. Using dyads we learn to trust ourselves and to speak from that place of inner awareness. Creating a space for just being who you are, as you are, as a human being, accompanied by another. 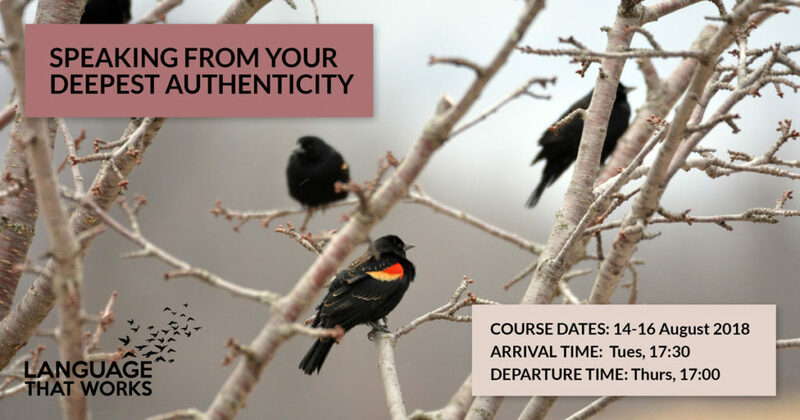 We are both very excited and passionate about creating this retreat in which we as a community witness and support the embodiment of our deepest authenticity. Perched on a ridge at the head of a valley in the Umkomaas river system in KwaZulu-Natal, the Buddhist retreat Centre looks out on a vista of indigenous valleys, forests and rolling hills receding like waves in the blue distance. Here, for more than twenty years people of all religions have come to experience peace and tranquillity. It is a gentle, sympathetic space where one can be still and get in touch with oneself and reflect on the things that crowd one’s life. See https://www.brcixopo.co.za/ for more information. We will start with dinner at 17:30 on the 14th August, but you’re welcome to arrive a little early at 16:00. We will end with lunch at 12:30 on the 16th August. All meals will be vegetarian. Let us know if you have special dietary requirements. This workshop is for all levels from beginner to advanced. Nicholas Burnand Since my teenage years, I have had the question “Is this it” There must be more to life than job, children, house, pension, death. This question led me on a quest to discover how I can live life more fully present, alive and with joy. My journey has taken me to remote places, and spending hundreds of hours in retreats, ceremonies, workshops, as well as in my own personal daily practice. I discovered the Dyad enquiry practice 4 years ago, and since then have been practicing and sharing it in the workshops, retreats, and one on one sessions that I offer as a CNVC certified trainer. Along with nonviolent communication, I have found the Dyad practice to be the most deeply transformative practice that I have encountered so far. Sarah Dekker Growing up in Ghana, Botswana, the Netherlands, Mozambique, South Africa and travelling a lot in between, I engaged with people from many different cultures and socio-economic backgrounds. In those spaces I found myself forever looking for connection, building bridges to overcome our stories of separation towards a common humanity. I studied gender & conflict studies, longing to better understand identity constructs and social hierarchies and to figure out how divides between us might be deconstructed. After university my focus shifted from the academic to the more experiential and spiritual, becoming more aware of my inner world and our interconnectedness with the broader web of life. I spent much time attending workshops and training in various modalities. Nonviolent Communication and Dyad practice have become essential components of daily life and the most transformative tools I have found towards healing and connection. This entry was posted in events and tagged authenticity, Durban, language that works, listening, NVC, speaking.